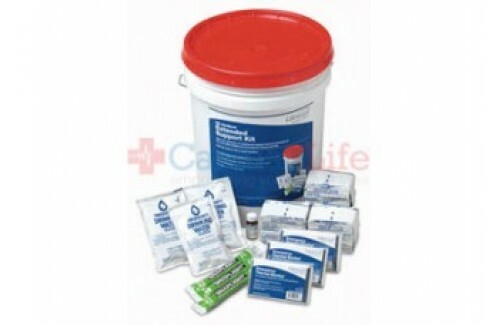 This emergency kit is an essential companion kit to the"25-Student Classroom Lockdown & Emergency Response Kit (21001)". It is designed using guidelines from leading disaster response organizations to meet the needs of students and staff in the event that an emergency situation lasts beyond a few hours. 12-hour light sticks (long-lasting light without batteries). 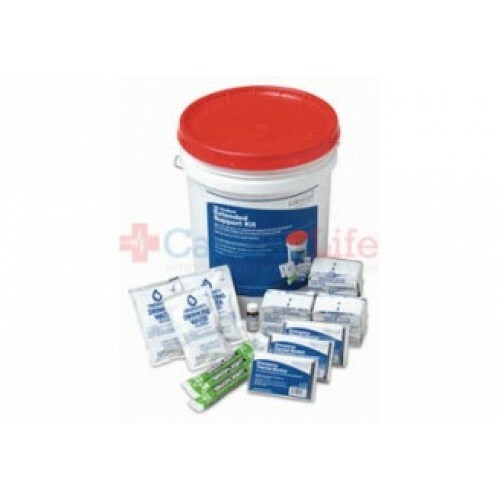 The survival kit is packed in a durable 5-gallon bucket for compact storage and use in carrying, purifying and storing additional water. The bright orange lid identifies the kit in an emergency, seals airtight, and is tamper-evident for security while stored. U.S. Government agencies and leading disaster response organizations recommend having adequate supplies to support your students and staff for up to 3 days (72 hours). To determine the total number of "25-Student Extended Support Kits (21010)" needed to meet the unique needs of your school's Emergency Response Plan, divide the total number of students and staff by 26 and multiply by the number of days for which you plan to be prepared. Packed in a waterproof 5-gallon bucket with carrying handle, and airtight tamper-evident lid. Bright orange lid identifies kit in an emergency.